A fortnight ago, Bukit Sembawang Estates held the preview for 8 St Thomas. The 250-unit freehold project located off River Valley Road in prime District 9 is completed. Another much-anticipated preview is Qingjian Realty’s JadeScape, a redevelopment of the former Shunfu Ville privatised HUDC estate. The master-bedroom of a four-bedroom unit at Jadescape. There are 261 four-bedroom units of 1,259 to 1,647 sq ft.
From South Beach Residences in the Core Central Region to Jadescape in the Rest of Central Region, developers are stepping up property previews as the Hungry Ghost Month draws to a close. This is an opportunity for developers to step out of the July property cooling measures. With the end of the Hungry Ghost Month on Sept 9, developers are using the window of opportunity to roll out new projects before year-end. This means homebuyers will have a wide range of condominiums across all market segments to choose from. City Developments and its joint venture partner IOI Group will hold the VIP preview of South Beach Residences on the weekend of Sept 8 and 9. The 190-unit project spans the 23rd to 45th storeys of a 45-storey tower, with the 634-room JW Marriott Hotel taking up the lower half of the building. 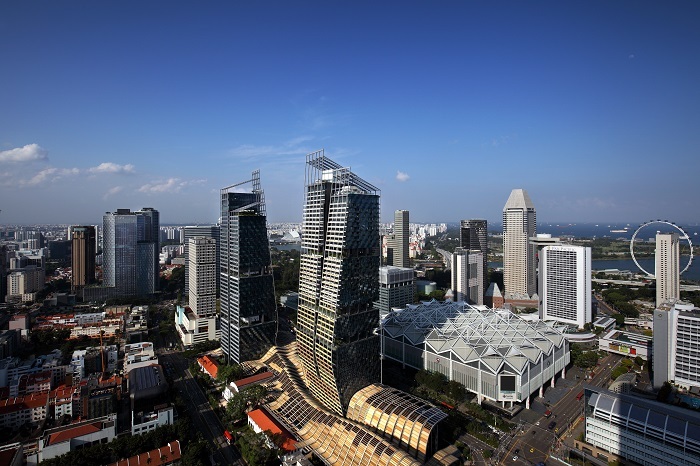 Located on Beach Road, the luxury hotel and residential tower is part of an integrated development that includes a Grade-A office tower and retail and F&B outlets and is directly connected to the underground Esplanade MRT station as well as to Suntec City convention and exhibition centre via an overhead bridge. Units at South Beach Residences are a mix of two- to four-bedroom apartments ranging from 936 to 2,616 sq ft. There are also six penthouses of 3,897 to 6,728 sq ft. Prices will be above $3,000 psf, according to market sources.